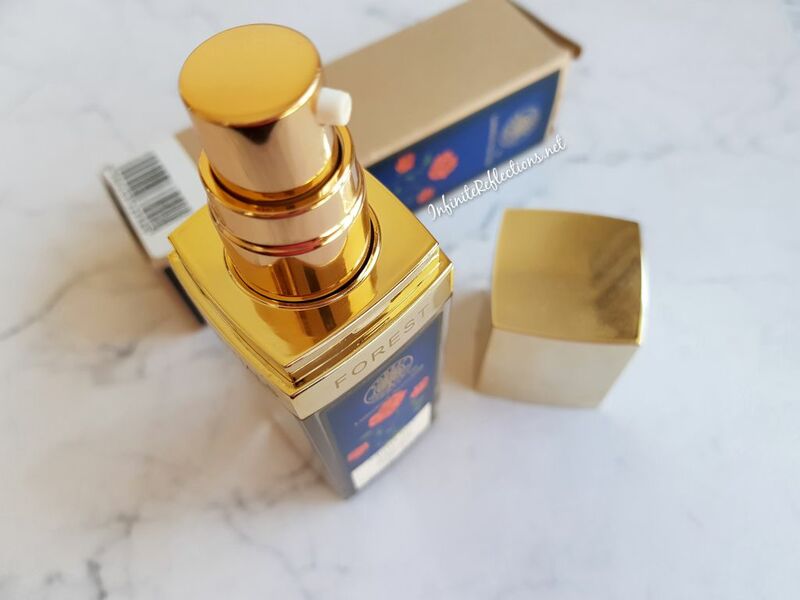 I have also reviewed some other products from the brand on the blog and I think in each post I have mentioned about how expensive their products are, so I will not dwell on that too much in this one. 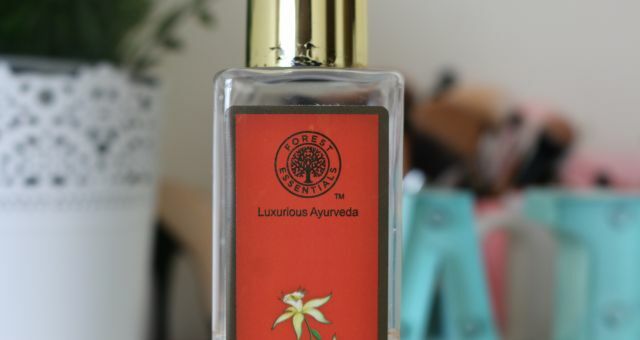 Yes, they are expensive for being an ayurvedic brand. But, let’s see if the product was good enough for me to actually repurchase. 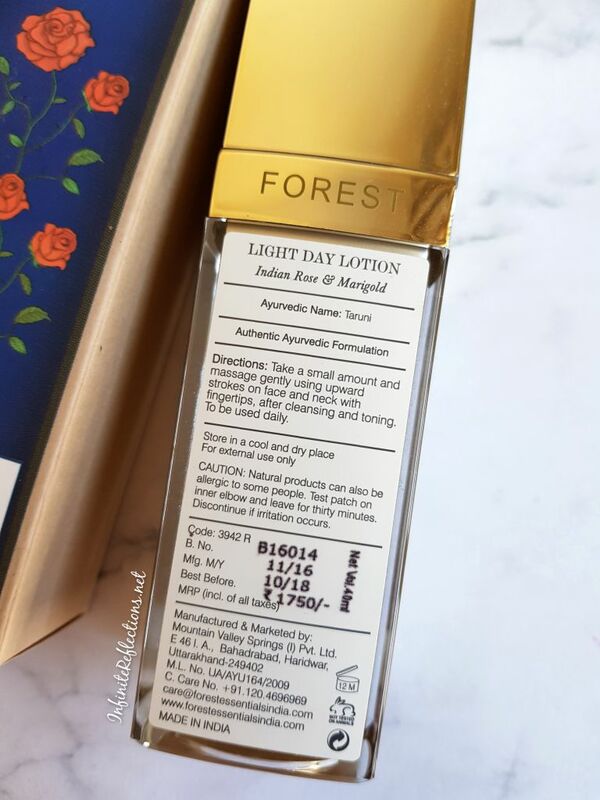 So, the Forest Essentials Indian Rose & Marigold Light Day Lotion has some amazing ingredients and some pretty heavy claims. It feels like it could be your perfect daily moisturiser. It claims to provide hydration, aid in cell renewal, lightens (Don’t care about that), brightens and also contains SPF. It claims to do everything that I want my day lotions to do for me. 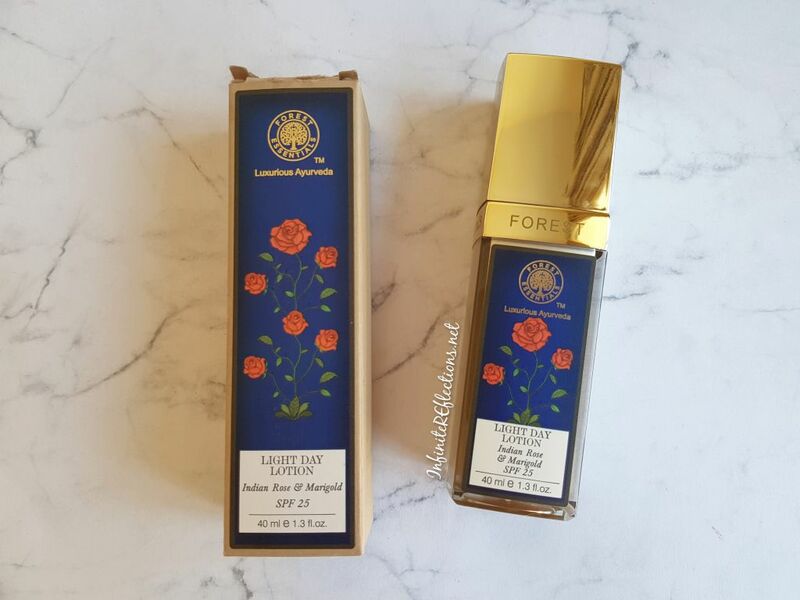 Its aromatic rose oil and soothing marigold extracts blended with highly emollient plum seed oil and rich rice bran oil, ensure skin lightening and brightening along with intense hydration and cell renewal. This product has an SPF 25 due to Yasada Bhasma, which is a natural sunscreen and an herb infused derivative offering long-lasting protection from the harsh rays of the sun and leaving skin supple, toned and fresh. 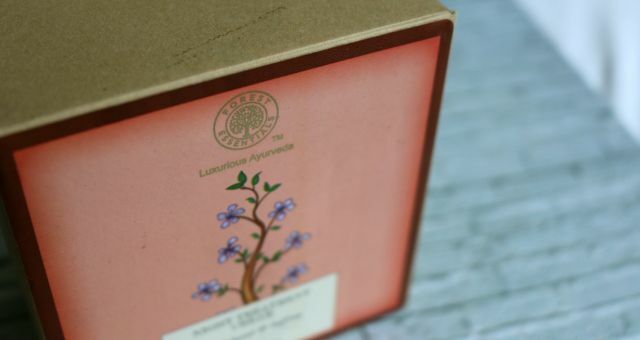 It contains Ayurvedic herbs like Ashwagandha and Gokharu along with Almond, Wheat germ and Olive oils, which not only provide nourishment but also prevent the skin from the damaging effect of free radicals. First and foremost, I absolutely love the packaging of this product. The bottle is so well made! Very sleek in design, opens with ease, closes tight securely, light weight, has a very smooth pump and looks so elegant on the counter. Honestly, one of the best packaging for moisturisers that I have seen. Love the color scheme as well. I may just keep the empty bottle and refill it with something else. The bottle is a plastic bottle, so it’s very travel friendly and I don’t have to be extra careful with it. It sure has scored some extra points from me just for the packaging. Very well thought out. When I purchased the lotion, it was for Rs. 1750 but I can see on their website that it now retails for Rs. 1925. I guess, the product price may have increased after GST implementations and it costs almost Rs. 2000 now. That’s pretty pricey for 40 ml / 1.3 fl. oz. of product. Considering, that there are many moisturisers available in the market with very similar claims, I am sure most of us will be weighing the pros and cons of the product. Now, coming to the actual moisturiser, there are a lot of things to love about it. The ingredients are very potent and at the end of the day you will be paying for some really good skincare. There are no harmful chemicals or minerals in the lotion. I really like the fragrance which this lotion has. 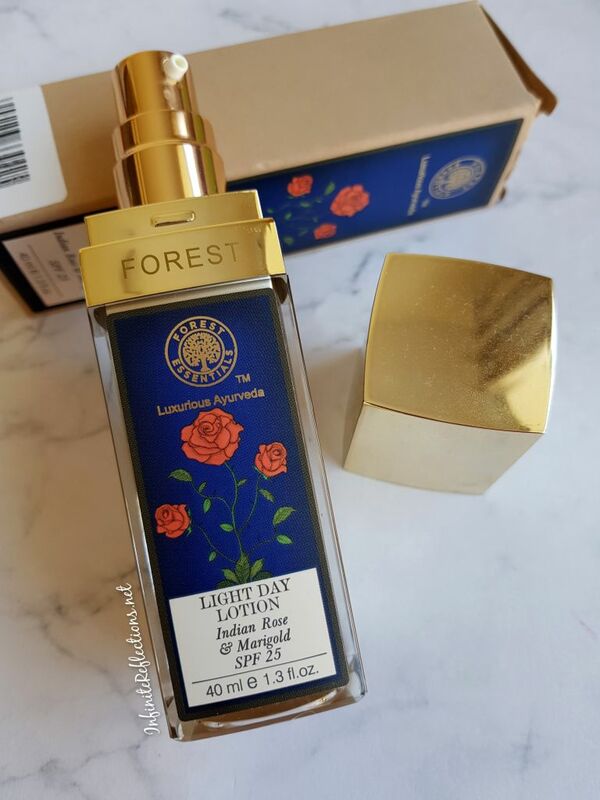 It is a light fresh rose scent which is really pleasing but not overpowering. However, my experience with the lotion has been good but not mind-blowing. I think this is a good lotion but I don’t know if it’s really worth the price. I do like it enough that I will maybe buy one more time. 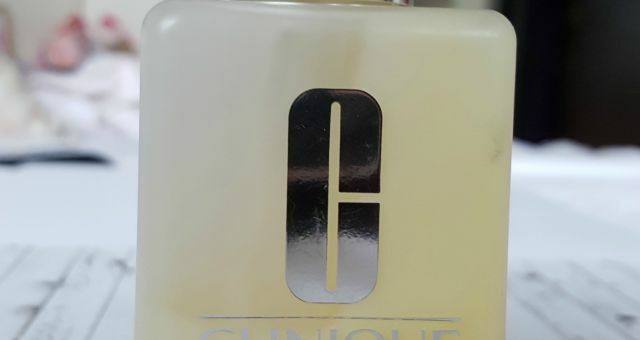 I agree with the claims of skin brightening as I noticed a change in my skin texture and my skin appeared more fresh and brighter when I used it daily. So, I think it does aid in cell renewal which makes the skin look more youthful, clearer and bright. It contains SPF 25, which is not a lot but at least there is some SPF in there. In my day lotions, I do prefer higher SPF but I have loved other day moisturisers without any SPF in the past so I can’t be too hard on that point. My main concern about this lotion is the hydration factor. It doesn’t provide enough hydration for my normal to dry skin for long period of time. It is very true to its name. It is a light day lotion, period. 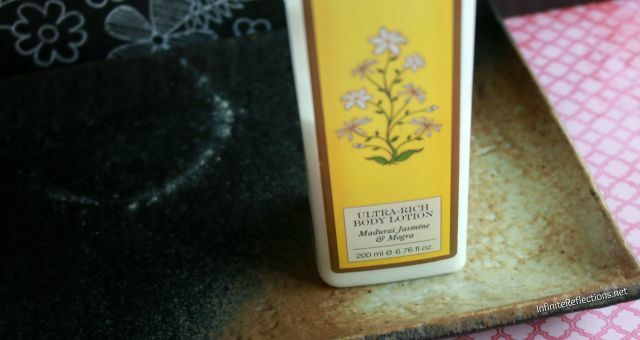 The lotion has a very light texture and absorbs very quickly into the skin, doesn’t feel greasy or leave any residue behind. But, I always feel the need to top it up with some other moisturiser after a while. So, i don’t think this product will be suitable for extremely dry skin. But, its worth a try for other skin types if you are ok to top it up with other moisturiser if needed. If this lotion provided a bit more hydration, then I would have just fallen in love with this. I have a feeling if you have normal to oily skin, you might like this product more. If you have tried this one, then do share your experience with this.